I finally got the chance to make my recipe exchange dish and I am so happy I did. It was a great dish, full of vegetables, protein and a delicious sauce. As I prepared it, CH said “wow, that smells good and totally different from any other smell that’s come from our kitchen”. It’s true, I very rarely cook eastern Asian dishes, aside from my recent Thai inspired soup & mango salad (both of which I learned from a cooking class). I guess this would be a good time to admit that I don’t like Chinese food (read: North American Chinese food). I really enjoy traditional dim-sum, but please do not ask me to order from a fast-food chain or those food-court counters in the mall – it would be my last choice of foods to eat for dinner. However, Vietnamese is a weekly go-to, and although I eat Thai less frequently, I still love the flavours that come with it. I love sushi & sashimi (especialy when I am home in Vancouver) and I really love izakaya style Japanese food. Korean and anything from south of Singapore is cuisine I have yet to venture in to. Anyways, back to this recipe. I signed up for another WC recipe exchange and the theme was “Asian”. Obviously this is a very diverse theme and could mean a lot of things, but when I received my recipe from The Cookaholic Wife, I was intrigued and content – and happy to give a new recipe a try; that’s what this is all about! I was also pleased that it was simple and quick to prepare!! I didn’t have any beef in the freezer and because we are leaving tomorrow for France (ACK!!) and I didn’t want to buy any additional groceries, since I still had some stuff in the freezer to use. Thus, I decided to swap out the beef for chicken & prawns, and it was a great decision! I’m not sure I would make it with beef next time – it was that good (and I don’t eat a lot of red meat anyways). I will definitely make this again, especially when I am in the mood for an exotic-flavour hit. Thanks Cookaholic Wife :)! Place the chicken and prawns into two separate bowls. Combine all of the ingredients, except the chicken & prawns, in separate glass bowl and whisk to combine. Pour 2/3 of the marinade mixture over the chicken and stir to coat. Pour the remaining 1/3 of the marinade mixture over the prawns and stir to coat. 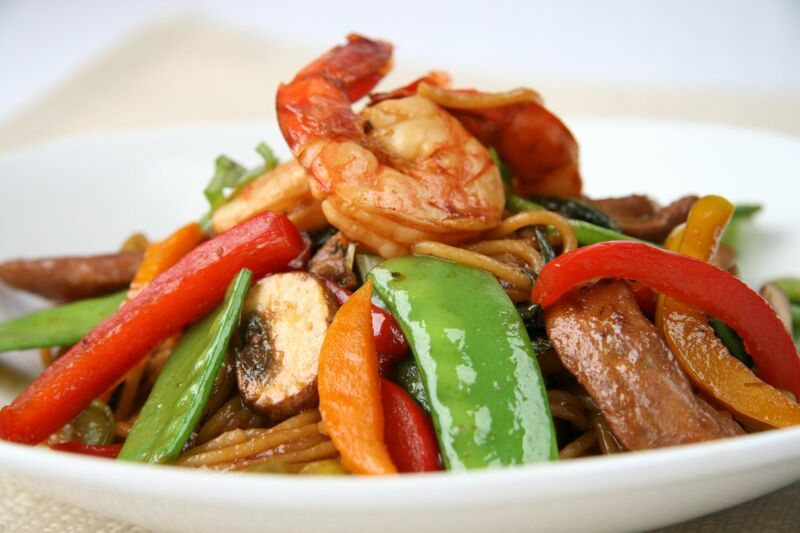 Set-aside the chicken & prawns to marinate while you prepare the vegetables below. (Note – the original recipe says to marinate the beef for 3-8hrs. I marinated the chicken & prawns for about 20 minutes in total. I prepared the meats and set them aside while I washed & sliced all of the vegetables. I was very happy with the results of this dish, but feel free to marinate the chicken & prawns longer if you wish!). Prepare your noodles according to the directions on the box. Drain and set-aside until needed below. Place a large skillet over medium heat and add oil. Remove the chicken strips from the marinade mixture and reserve. Place the chicken strips into the sauté pan and cook until nicely browned on all sides. Add the reserved marinade to the pan and bring to a boil. Add the prawns and its marinade to the sauté pan with the chicken & sauce and cook for 2-3 minutes (until the prawns are pink and starting to curl inwards). Remove the cooked prawns from the pan and set-aside. Now, add all of the vegetables to the sauté pan, except the sugar peas, along with the additional 1tbsp of sriarcha, 1tbsp rice wine vinegar and 1 tbsp of soy sauce. Cook the vegetables in the sauce & chicken mixture, until the vegetables are slightly soft – about 5 minutes (I prefer quite crisp vegetables, so feel free to cook them longer if you like them a little softer). 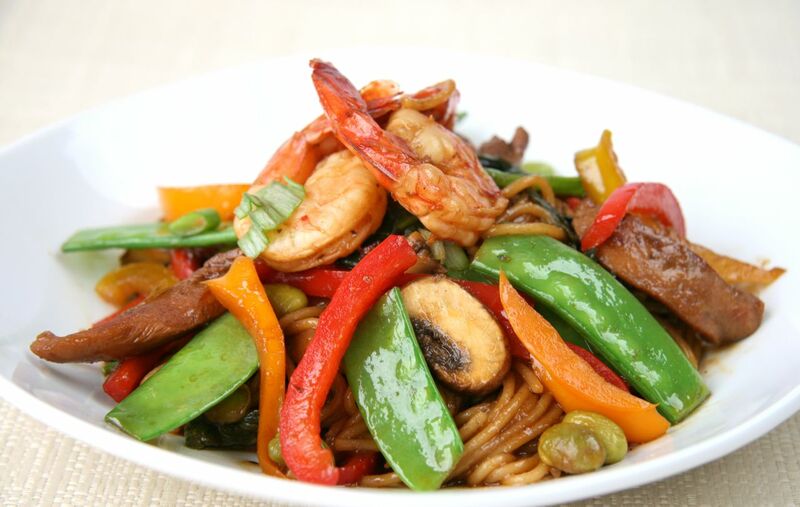 Add the cooked noodles, snap peas and cooked prawns to the chicken and vegetable mixture and stir well to combine. Allow it cook for a few additional minutes, to allow the noodles to soak-up the additional sauce. Season with additional S&P and serve immediately! I don’t know what took me so long to roast a whole chicken. I will definitely admit that I had a fear of attempting it, but I don’t know why. All I can say is that it turned out to be SO easy and I wish I’d added it to my repertoire long ago. My girlfriend (and a fellow blogger!) was over for our Tuesday night cooking/Glee get-together and I decided it was time to attempt a roast chicken, once and for all. I knew exactly what recipe I wanted to try, my French (and Canadian!) idol, Laura Calder. I watch her show religiously on Food Network and seriously love every recipe I’ve ever made of hers. 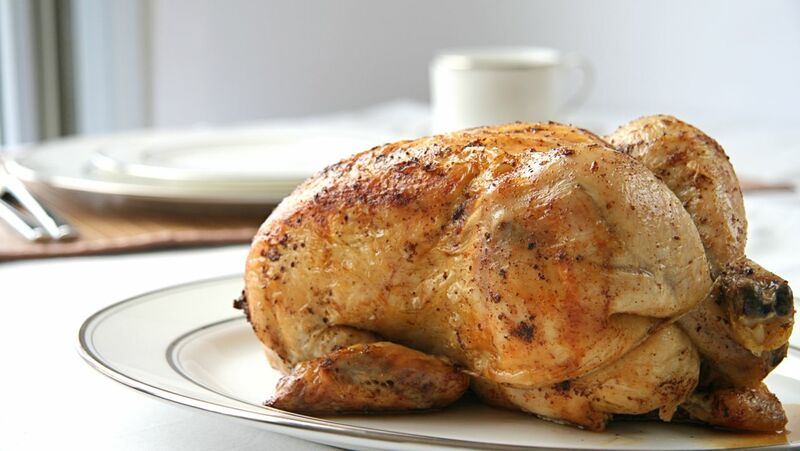 She featured this roast chicken recipe and made it look so easy, I knew I had to try it. This chicken is an indulgence, but it is worth it. The technique of rotating the chicken & basting it as it cooks creates an incredibly moist chicken but also allows it to have a beautifully golden-crisp skin, which in my opinion, is essential. The juices that run-off the chicken, combined with the flavoured butter, creates an incredible au-jus, that you drizzle over the chicken at the end. The herbs and lemon add a beautiful yet delicate flavour to the chicken, but feel free to play around with the herbs to your liking. This is a perfect Sunday dinner star, or would be a great main-dish feature for your Easter dinner. It’s a crowd pleaser, so simple to prepare and quite impressive when it’s placed on the table. It also makes delicious leftovers for sandwiches! When you are just about ready to place your chicken in the skillet, place your cast-iron skillet in the oven for 5 minutes to pre-heat it. Tie the sprig of rosemary, thyme and tarragon with a small piece of kitchen twine. Pat the chicken thoroughly with paper towels, ensuring the skin is dry. Remove the pan from the oven and place the chicken on one its left-leg. Top with the cubed butter and place in the oven. 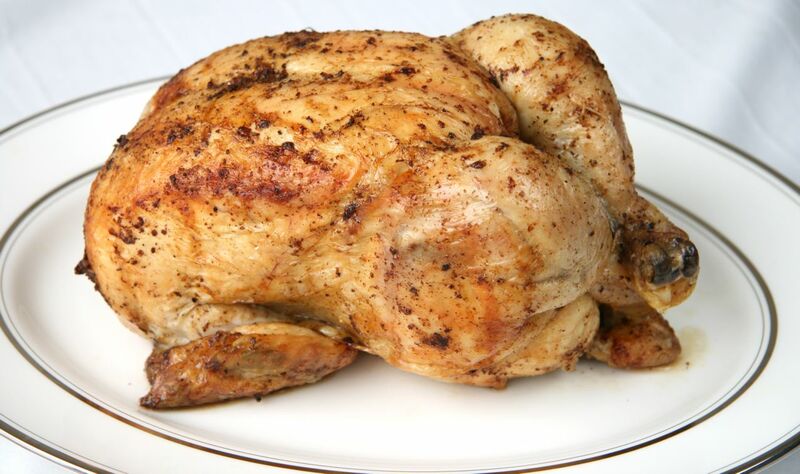 Flip the chicken to its right-leg, baste with the juices and roast for 15 minutes. Flip the chicken to its back, baste with juices and roast for 15 minutes. Finally, flip the chicken to an upright position (its stomach), baste with juices and roast for a final 25 minutes, or until chicken juices run clear. Remove the chicken from oven and allow to rest for 10 minutes before serving. Remove the kitchen-twine, lemons, herbs and garlic from the cavity of the bird before serving. While chicken is resting, place skillet on stove-top over medium heat. Bring the juices in the pan to a boil, add the 1-cup of chicken stock and whisk to incorporate. Drizzle over-top the chicken immediately before serving, or serve on the side and allow your friends/family to add the jus themselves. Wow, these were good and SO simple to prepare. They definitely taste like they took a lot more work than they did! It was CH’s birthday on Sunday and I told him that I’d make him anything he wanted for dinner. I told him lamb, steak, halibut…anything. He hemmed and hawwed, but couldn’t decide. He knew he wanted his chocolate cake and bruschetta – but couldn’t decide on a main dish. 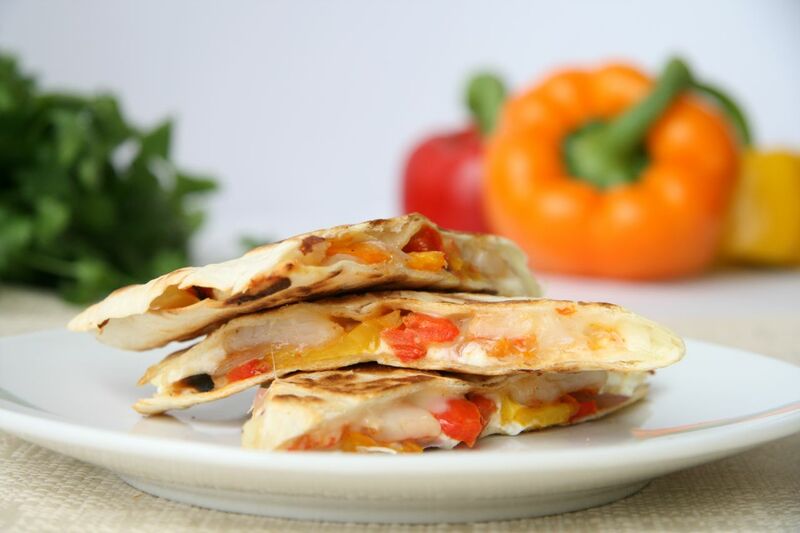 He finally decided… quesadillas. I came upon Eat Live Run’s recipe and knew it was perfect. CH (as we know) LOVES goat cheese and shrimp, so it was a perfect combo. I also liked the addition of the roasted veggies and of course, the spices! I also sliced my shrimp in half, horizontally, which gave me double the amount of shrimp and ensured that every bite had a good amount of shrimp! Yumm! The flavours worked so well together, the warm creaminess of the goat cheese, mixed with the spicy shrimp and sweet roasted peppers – it was definitely a match made in heaven! I roasted my own peppers (an additional step from the original recipe) and added some garlic powder too, which I feel just really added to the flavour. I also used mozzarella, which blended really well with the goat cheese! Topped with a little sour cream and fresh guacamole, they were so tasty! Note – I do my quesadillas a little differently. I use one tortilla per quesadilla. I lightly brown both sides of the tortilla, fill one-side of the flattened quesadilla with the goodies and then fold-over the other side and allow to brown a little more on both sides (and blending the flavours/melting the cheeses). In my opinion, this way is much easier and keeps more of the goodies inside when you cut/serve it. Definitely give these a try if you love goat cheese (and shrimp) as much as we do! It will be on our table in the near future, I can guarantee that! Preheat your broiler to the HIGH setting. Place peppers and onion on a baking sheet and place under broiler. Allow to cook until each side’s skin is blistering and softened (around 5 minutes per side or 10 minutes total). Once all sides are sufficiently blistered, remove from oven, place in a glass bowl and cover with plastic wrap. Set-aside until ready to use! While peppers are broiling, prepare the shrimp. Heat a small sauté pan over high-heat. Add olive oil and allow to heat for 30 seconds. Add shrimp to the pan and cook for 1 minute. Remove shrimp from heat and set-aside to cool. Once cooled, slice the shrimp in half horizontally (essentially butterflying the shrimp but completing separating them). Heat a large frying pan over medium heat. Place one tortilla in the pan and allow to brown slightly on both sides (around 1 minute per side). Remove the tortilla from heat (and remove the pan from the element until ready for use again) and scatter mozzarella on one side of the tortilla. Layer 8 pieces of shrimp (4 whole shrimp) on-top of the mozzarella and scatter the peppers over-top. 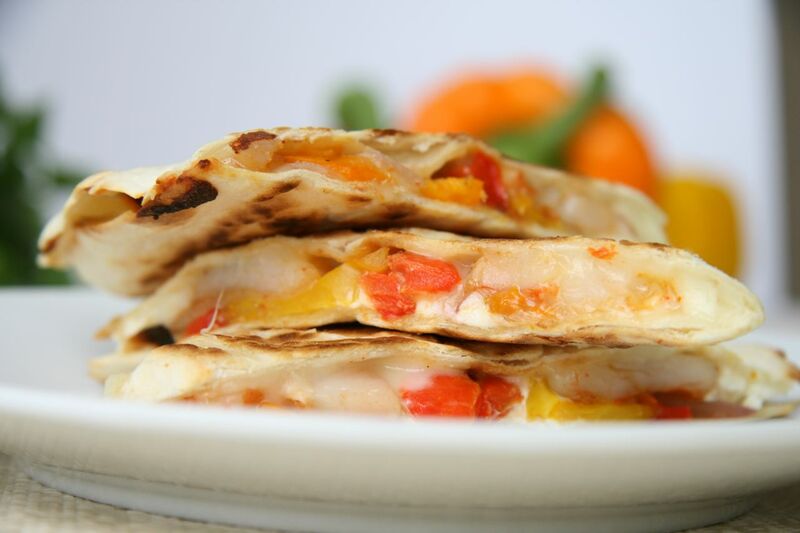 Crumble the goat cheese over the peppers & shrimp and fold-over the tortilla. Press down firmly on the tortilla to incorporate all of the ingredients. Return the filled-tortilla to the pan and cook on both sides until nice and brown and the cheeses have melted (about 3 minutes per side). Remove from heat & repeat with remaining ingredients.